The appellation of Les Baux-de-Provence is unmistakably Provençal. Between olive groves and pine forests the rocky landscape is wild with the fragrant garrigue that marks its wines. Although the appellation is small and relatively new, the handful of winemaking estates there have earned well-deserved praise for their farming practices. As much as 85% of the area is devoted to an organic or biodynamic approach. It is the home of perhaps the most well-regarded estate in all of Provence, Domaine de Trévallon. Not far behind Domaine de Trévallon in stature is Dominique Hauvette. In the early 1980s Dominique left her job as a lawyer in the Savoie, began studying oenology, and eventually amassed a little over 40 acres of vineyards along with an international reputation for producing model Provençal wines. Domaine Hauvette is situated at the foot of Les Alpilles mountain range outside Saint Rémy-de-Provence, a small commune perhaps most famous for a little painting called “The Starry Night” that was created by Vincent van Gogh as he was being treated in the psychiatric center at Monastery Saint-Paul de Mausole. As the crow flies it’s about 15 miles from Châteauneuf-du-Pape in the southern Rhône. Indeed, the Rhône River is just a few minutes away by car. The limestone foothills of Les Alpilles create a distinct landscape and microclimate. The soils retain moisture during the arid summer months, the legendary Mistral wind cools the vines and expels mold-fostering humidity, and Les Alpilles buffer the vines from potential damage. Dominique began converting to biodynamic cultivation in 2000 with the goal of growing ideal fruit. At harvest, grapes are picked by hand and sorted in the field. She employs minimal intervention in the cellars, fermenting with indigenous yeasts. 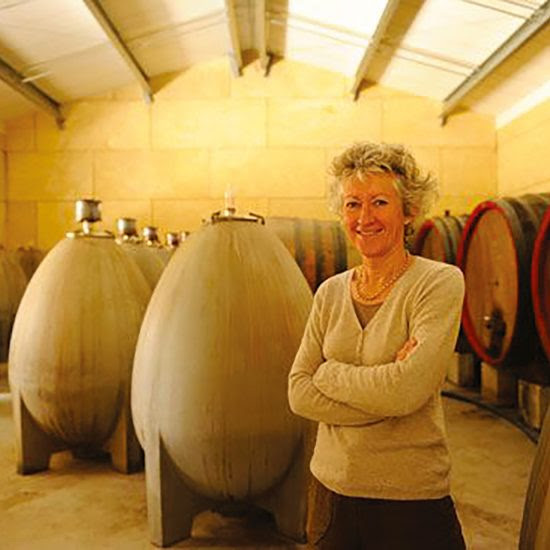 Many of her wines are fermented and aged in concrete eggs that allow a continuous flow of liquid during the process as well as stabilize temperature. From a five acre plot of Rousanne with an average age of 15 years. Cuvée “Jaspe” is fermented in cement eggs and aged briefly in stainless steel tank. A field blend of equal portions Roussanne, Marsanne, and Clairette from a 1.7 acre plot with an average age of 23 years. Cuvée “Dolia” is fermented and aged in cement eggs. A blend of 50% Grenache, 30% Syrah, and 20% Cabernet Sauvignon from vines with an average age of 40 years. Cuvée “Cornaline” is fermented in wood tanks and aged in foudre. It’s rare to find a wine this ambitious made predominantly of Cinsault. 60% Cinsault, 30% Carignan, and 10% Grenache from vines with an average age of 40 years. Cuvée “Améthyste” is fermented in wood tanks and aged in cement eggs. A truly special Roussane-based dessert wine elaborated by the passerillage method of desiccating the grapes to concentrate sugars much like the great Vin de Paille (straw wine) of Hermitage. Cuvée “Compendium” is only made in vintages that have the optimum conditions to create this type.